The Moon is in Scorpio today. The Moon is also void all day (it enters Sagittarius at 1:18 AM tomorrow). There aren’t any major aspects today, so be a Voidoid and use this void-Scorpio-Moon energy to “disappear” for a while or go deep and explore interior terrain, rather than trying to make a big noise in the outer world. You might be surprised at the revelations you unearth in this “out of time/out of sync” period. Minor aspects today indicate we’re not sure it’s really worth it to extend ourselves, anyway. We’d like people to respect our feelings but they may not be on the same wavelength. Moon/Pluto aspects reinforce the Scorpio theme (Pluto is the ruler of Scorpio) so we may need to learn to deal with our intense reactions or channel that energy towards transformation rather than letting it consume us. There’s a lot bubbling under the surface today! Things may not go as expected in the afternoon, so be ready to change plans quickly if needed. The Keyword for the Sabian Symbol is “Endurance ”. The Keyword for the Kozminsky Symbol is “Complications ”. The Kozminsky Symbol certainly reflects the Scorpio/Pluto themes today. There’s a need to look under the surface to see what’s really going on. There’s something we might not see (or maybe we don’t want to see it–the bandaged eyes could reflect either of these meanings), and it’s not wise to enter into contracts without being fully informed. There are issues related to trust and who we can trust. We can unnecessarily complicate our lives by poor preparation and inattention to details or by giving over our power to unscrupulous types. 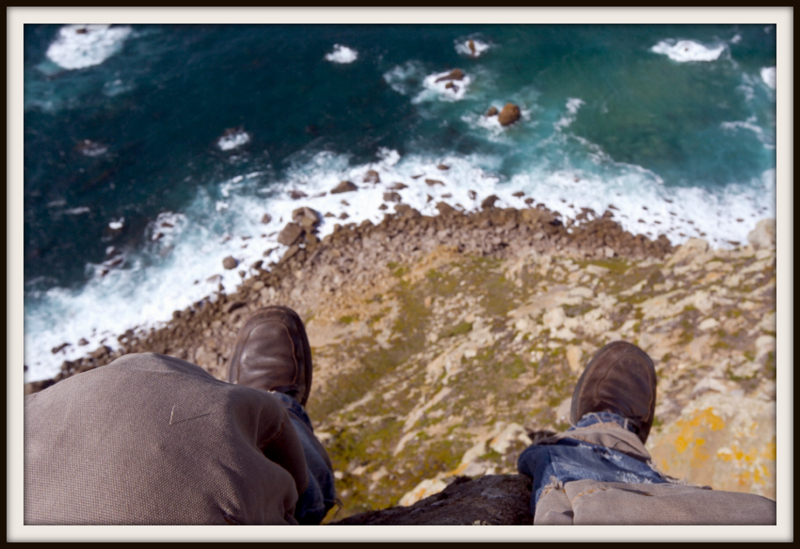 The Sabian shows a person in a potentially hazardous situation, on a precipice. Care must be taken to get out of the situation. It’s a challenge which can take us to a new level of competence if we act wisely, or lead to disaster if we’re not careful. We may have to stop and reassess before moving on, to take some time to reflect (as noted above, it’s that kind of day today). After contemplating the astrological aspects and the Symbols, it seems that today is a real “choice point” kind of day. We’re in the eye of a hurricane, a time of quiet in the midst of furious activity. We know the storm will resume, but right now everything’s perfectly still and in a kind of “holding pattern”, enabling us to reflect and determine our next move. Bobbie Gentry, Norman Lear, Maureen Mc Govern, Alexandre Dumas Jr. (“The Lady of the Camellias”), Betty Thomas (actor/director), Ludovico Sforzo (Duke of Milan),Murad IV (Sultan of Turkey), Jean Bernoulli (mathematician), Charlotte Corday (murdered Murat), Donald Crisp (actor), Joseph Tinker (Hall of Fame baseball player), Charles Vidor (film director), Leo Durocher (baseball manager), Asfa Wossen (Crown Prince of Ethiopia), Vincent Canby (critic), Keenan Wynn (actor), Doc Pomus (songwriter), Harvey Fuqua (The Moonglows), Nick Reynolds (Kingston Trio), Anna Dawson (comedian), Don Galloway (actor), Shirley Anne Field (actor), Pina Bausch (dancer/choreographer), Al Ramsey (Gary Lewis & the Playboys), Yahoo Serious (comedian), Carol Leifer (actor/comedian), Daniel C. Burbank (astronaut), Karl Mueller (Soul Asylum), Juliana Hatfield (musician), Triple H (pro wrestler), Maya Rudolph (actress, daughter of singer Minnie Ripperton), Pete Yorn (musician), Alsou (Russian pop star), David Muse (Firefall), Henry Vrienten (Doe Maar), Toktar Onyarbajewitch Aubakirov (cosmonaut, Soyuz),Ivanovich Dedkov (cosmonaut), Gary Gygax (created “Dungeons & Dragons”), Bob Thiele (record producer), Elizabeth Hardwick (critic/novelist), Nikolai Cherkasov (actor), C.S. Forester (novelist), Lupita Tovar (actress), Hilaire Belloc (poet), “Mystic Meg” (British astrologer and psychic), Jonathan Rhys-Meyers (actor), Alex Rodriguez (“A-Rod”, baseball player), Rudi Schneider (Spiritualist), Rory Mcdonald (Runrig), Takashi Shimizu (film director), Bernard Coyne (on of one 12 people who reached over 8 feet in hieight), Bill Engvall (stand-up comedian), Mario Del Monaco (tenor), Jo Durie (tennis champ), Julia Parker (astrologer), David Blair (ballet dancer), Rex Brown (Pantera), Robert Holmes A. Court (Australia’s first billionaire), Frencesco Corteccia (Renaissance-era madrigal composer), Ciaran Fitzgerald (actor), Celestin Ringeard (monk kidnapped and killed in Algeria, 1996). “Healing Guide”. This combination tells us that we’ve been through the worst, and if we’re open to guidance, we can heal our past. It feels to me like a Guide spirit coming through to offer hope and inspiration. This fire/air combination can clear out the cobwebs that have gathered around us and pushes us forward into the future. The Star is associated with Aquarius, whose ruler is Uranus. Uranus is currently in the fire sign Aries (Wands are fire cards), so we’re urged to step up and assert ourselves, to claim our turf as unique and inspired beings and let the creative ingenuity flow! Channel that restless feeling –it may lead you to a future beyond your wildest imaginings.